System.out.println(y); //4 .unexpecompile time errord type. Increment or decrement operators, we can apply Only for variables not for constant expressions. Violation leads to Compile time error saying unexpecompile time errord type Required: variable but found=value. we can apply increment/decrement operators for variables only one time. Ie . nesting of increment/decrement operators are not allowed. Increment/decrement operators, we can’t apply for the final variables. Violation leads to compile time error saying can’t assign a values to final. Increment/decrement operators, we can apply for floating point data types. System.out.println(10/0); //Runtime Exception by zero . But in the float and double classes for representing infinity constants are defined. final float negative _ infinity are the constants contain in float class. 0/0 is undefined in the Integer class for representing undefined results there is no constant available . Hence 0/0 results arithmetic exception. undefined values there is a commands available . public static final float NaN. Float . NaN = =Float. NaN. Float. NaN !=Float. NaN →true. if one are comparing NaN with any other , including NaN itself, the result is always false, except for not equal(!=)operator. 2. only in the cone of integer arithmetic. 3. / and % only there two operators result in Arithmetic exception. ‘+’ is the only operator in java which in overloaded. We can one for arithmetic addition and for string concatenation. * If at least one operand is of string type then + acts as string concatenation operator other wise + acts as arithematic operator. For compression of data also used these shift operators frequently use in j2me edition. a << b shift the bits of a ,b times to the left hand side. a>>b shift the bits of a ,b times to the right hand side by filling the left hand side bits with sign bit. 8 >> 1 --> 0000 …….100 = 4. Filled with sign bit zero. a >> b =a/2 power b for 8 >> 1 =8/2 power 1 =8/2=4. If b >31 then b= b% 32. - 8 >> 1 ---> -8/2 power 1 = -8/2= -4.
a>>> b , shift the bits of a, b times to the right hand side. 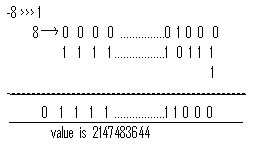 By filling left most bits with zero always.If a is +ve ,then there is no difference between right shift and unsigned right shift operator.Except shift distance zero ,the result of unsigned right shift operator is always positive. In a << ,>> ,>>> b ,If a and b ,both are compile time constants then the compiler won’t go for formula for the result type.If at least one in the variable ,either a or b then the compiler checks the type of the result which is max(int,type of a) , the type b never participated in the result .